Preeti is a technical content writer with Cloudwalk Hosting. She is having expertise in cloud-based accounting software and tax application. With the increase in the diversity of the accounting system, the demand of a proper accounting system has also increased and the only accounting software which perfectly matches the accounting needs of small and medium-sized businesses is QuickBooks. QuickBooks is one of the most popular and useful accounting software which is specially designed to meet the diverse needs of small and medium-size businesses. The reporting tools available in the software allow the user to turn the lengthy and cumbersome accounting processes into cakewalks. There is a long list of things which you can do in QuickBooks, so if you are looking for using the Advance setting options of your QuickBooks, then you are at the right place. That’s why in this blog post, we will be looking at the step by step process of setting up advance setting in QuickBooks online. How to set up advance setting in QuickBooks online? Finally, click on edit Other Preferences and then make changes to the Customer label and save Other Preferences. Accounting- This feature of the advanced settings allows you to store your firm’s fiscal year. The options for accounting given are cash and accrual, and that’s why many small businesses use the cash method. Chart of Account- It allows you to enable or disable the account numbers. It gives you the options of Discount account and accounting numbers. Categories- You can add class and location through this feature. Through this feature, you will be able to categorize income and expenses by department or location. Time tracking- It allows you to specify defaults for timesheet, like adding fields and the first day of the work week to display. Multi-currency- Allows you to keep track of transactions in foreign currencies. 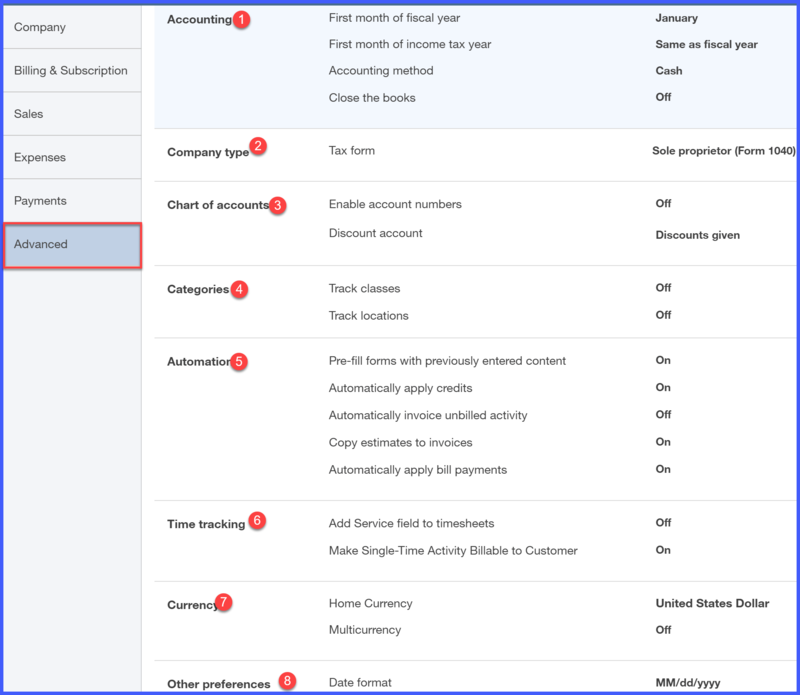 There are varieties of options available in QuickBooks advanced settings through which you can customize and make QuickBooks run according to your own preferences and choices. So make the most of the most highly-advanced software and use the advanced setting to make your life quick, easy and accurate. For more details and tips, please visit my Experts Exchange Profile page.